Direct Lease Driver of the Month, John Hoffler, Sanford, N.C., has more than 22 years of experience as a professional household goods mover, 17 of which are with the van line. John has a great driver rating and this is his second Driver of the Month award with the van line. Gocha Darbaidze, Willies Transfer & Storage, West Palm Beach, Fla., earned Wheaton’s Permanent Fleet Driver of the Month award. 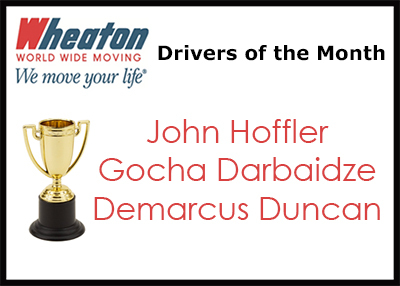 Gocha has more than 15 years of experience as a professional mover and this is his third Driver of the Month award. Demarcus Duncan, Crown Moving & Storage, Inc., Indianapolis, Ind., earned Wheaton’s Intermittent Fleet Driver of the Month award. Demarcus maintains an excellent performance rating and has 16 years of experience as a professional mover. This is his second Driver of the Month award with our company.